Sea kayaking with seakayakphoto.com: Economy of scale. This is the Maersk Beamont entering the Clyde on the 2nd of May 2009. 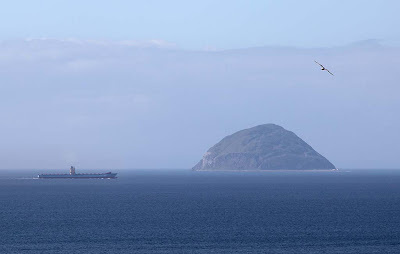 We had stopped on Bennane Head to get a good view of Ailsa Craig. At first we thought she was an aircraft carrier but it was soon apparent she was an empty container ship. It is unlikely that Scotland would have enough exports to fill such a giant ship. Indeed tonight, a week later, she is still anchored in the Clyde north of the Cumbraes. It would apear that she is a victim of the economic crisis and has come to the Clyde for shelter and to weather out the recession. She was launched in Germany on 30/11/2007. She is 294m long with a beam of 32m and a draught of 13m as such she is one of the largest ships to enter the Clyde. You do need to be careful when crossing to Ailsa Craig! I have posted about the history of the Maersk Line previously.